Most of us want to care for our family members at home, but sometimes they need more advanced care then you are able to provide on your own. The need for skilled nursing care can becomes an immediate issue if a loved one experiences a stroke or a fall, or suddenly becomes ill and can no longer attend to his or her own care and personal hygiene. 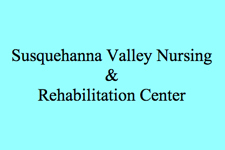 Susquehanna Valley Nursing and Rehabilitation Center combines personalized medical care, social services, and a comfortable, at-home atmosphere for your loved one.